The Hautes Alpes are situated at the junction of two climates, a continental climate and a Mediterranean climate. This combined with the range of altitudes and the highly varied geology of the area result in a vast diversity of flora. The Ecrins National Park for example has1800 species of plant recorded, that’s 80% of the total number of species in the Alps. The Queryas www.parcs-naturels-regionaux.tm.fr , this is also a protected area but here you are allowed to both ride bikes and walk dogs. Please be careful with dogs as this is sheep grazing country, also since the reappearance of wolves in the area more and more of the flocks are protected by the big white Pattou sheep dogs who do not welcome any other canine in sight of their charges! Another advantage for those interested in botany in this area is that the range of altitudes means that spring arrives in different places at different times so in a week in early May here you can see the first of the spring bulbs, the purple and white crocus that flower just as the snow melts back from them in the high fields of the Queyras and then the next day see full spring meadow flowers or cowslips on the lower valleys and the new green bud burst in wooded valleys. Obviously seasons vary so timing of flowers can not be precise its often best to contact us just before your arrival and we’ll try and suggest a few itineraries. End of April and May are the best time to come for spring flowers, some examples are the fields of narcissus which greet you as you drive over the col du Lautaret, the delicate alpine snowbells in the Queyras and the spring bulbocodium erupting like pink stars as the snow fields melt. Pasque flowers are normally also in flower at Vignettes in the Durance gorge and in L’Argentière at the clock tower. In general May and June are the best for flowers in the lower valleys and you can still enjoy the spring bulbs by heading higher. In the meadows you should be able to spot globe flowers and several varieties of orchid along with margarites and scabious. In the higher pastures the gentian will be coming into bloom. In July the higher valleys are in full bloom and the displays of orchids can be wonderful. Lower down the hot, dry Mediterranean climate is starting to show with displays of thistles and lavender on the dry hillsides growing between the junipers. At the end of July you should find Martagon lilies coming into flower in damper areas of dappled shade such as along the botanical trail that follows an old irrigation canal at Puy St Vincent. 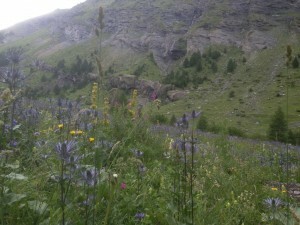 It is in late July and early August that the Chardon Bleu or Queen of the Alpes come in to bloom in the Fournel Valley . This rare and protected plant grows in only a few places and the reserve in the Fournel valley is one of them. Regular guided minibus tours go up the valley to view them lead by a Park Warden, you can also drive up but the road is unmade and can be bumpy! The Ecrins National Park has a varied fauna with 231 recorded species of birds and 68 species of mammals. Chamois, Ibex, hares, golden eagles and marmots are some of the species reasonably often seen. Lynx and wolves have been seen on the edge of the park and are definitely reintroducing themselves in the area, much to the consternation of the local farmers. The park wardens run regular walks to help you see some of this diversity; you can get a list of walks either from the tourist information or from the Maison du Parc in either Vallouise or Briançon which are worth visiting for their interesting displays. Ibex are most easily seen during the rut, in late October or November when it becomes easy to see how these impressive animals were almost hunted to extinction. The best place to look is above Pont de L’Alp on the road towards the Col du Lautaret. A half-hour’s walk up here on the path towards the Grande Lac should enable you to get surprisingly close if you are careful. Please don’t disturb them; this is not a good time to have your dog with you! Also be prepared to find snow up here, even if there isn’t any at the bottom of the path. Chamois come down lower in the winter so are more easily seen, many accompagnateurs run snowshoeing trips to see them see the tourist offices or national park offices as above. I have seen them frequently on walks in late autumn and winter into the high valleys above Ailefroide and Nevache. Golden Eagles circle the skies on the thermals and it is surprising what you can see from a ski lift between the trees in late spring, but if you really want to go bird watching take your time and choose a less frequented area. The botanical trail in Puy St Vincent winds through woodland as well as meadow fringes, the banks of the rivers are always a good spot, you can often spot dippers on the Durance in the middle of L’Argentière. With the wealth of flora there comes a wealth of butterflies and moths in the early summer, 175 species of butterflies and 244 species of moths have been recorded in the Ecrins national park. Obviously look for these where the flowers are but you also see large numbers at puddles or on the edge of shallow pools such as on the bike ride around the Onde . The lac des Chardonnières which you can walk to from the Col de Pousterle is a great favourite with dragon and damsel flies , and the meadows at the col have great butterflies as well as a super view. The woodland here is garden managed rather than clear felled; this ensures that there is a shrub level for habitat and also clear viewing for bird watchers.